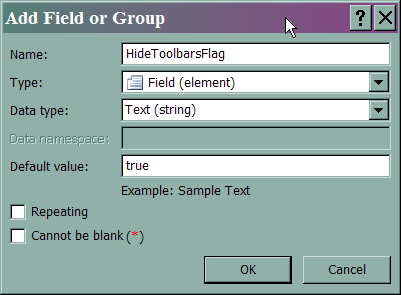 InfoPath Code to Hide All Toolbars When Filling Out a Form | Are you a user? There are probably several ways to do this, but this seemed pretty straightforward to me. The code loops through the CommandBars collection that is part of Microsoft.Office.Core and sets the Enabled property to false. If you want, you can selectively inspect each toolbar in the collection and enable/disable specific ones. You can use the Context Changed Event to set a spiffy title for your form. 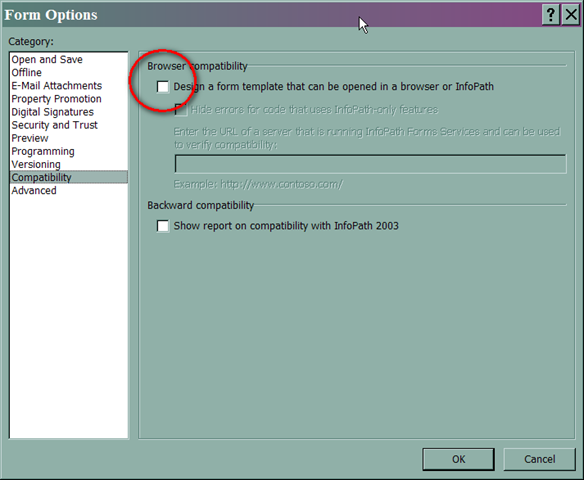 Be aware that, if the Context Changed Event is grayed out, you need to change the form’s browser compatibility options so it is not able to be opened in InfoPath Forms Services. Since we are using code, you’ll have to fully trust the form and sign it. 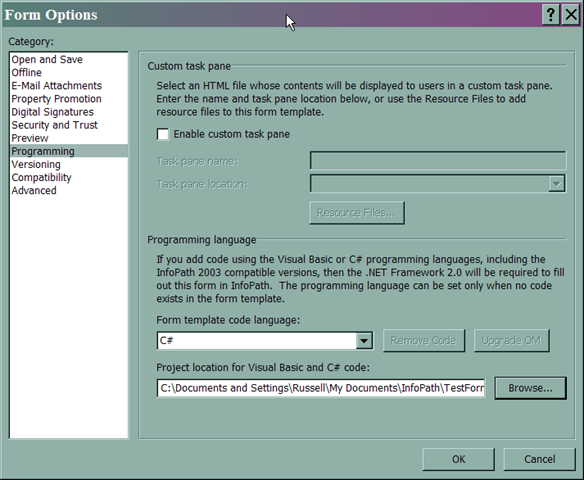 We’re using C# in this example, so set the form template code language to C#. Add a reference to Microsoft.Office.Core by browsing to MSO.DLL in your Microsoft Shared folder. You can see it here in my list of recent references. 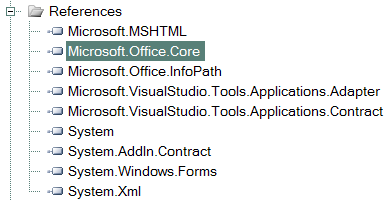 Now you should be able to add the USING statement for Microsoft.Office.Core. 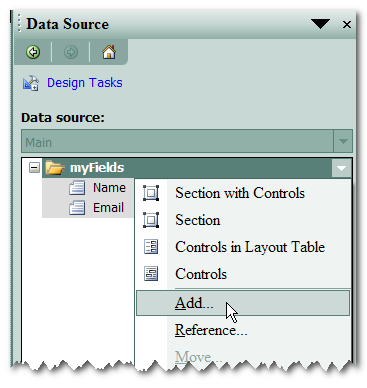 In order to control whether the toolbars are displayed or not, a field is added to the data source. Add the element, HideToolbarsFlag, that will control whether or not to hide the toolbars. This bit of code retrieves it’s value. 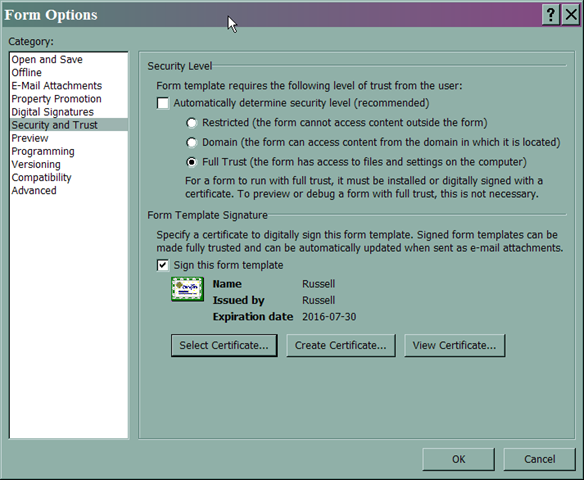 If you set the default value to true, it hides the toolbars; anything else, it doesn’t. And now preview your form. This works nicely in 2007, but not so much in 2010. The Menu Bar and Quick Launch are still visible. Would you have code to resolve this in InfoPath 2010?